I love just about everything that comes with wearing makeup – apply it, removing it, shopping for it. But cleaning my makeup brushes? I could do without that part. And in fact, I often do. I definitely don’t wash them as often as I should. My signal that it’s finally time comes when the bristles on my go-to eyeshadow brushes are so gross all my looks turn a singular muddy shade of sorta glittery brown. Having a good cleansing method does take a lot of the stress and guesswork out of the situation. If you have an effective makeup brush cleaner, you’ll be less likely to put off the task. From DIY options to instant brush cleaners to deep-cleaning shampoos and fancy tools, there are a ton of makeup brush cleansers on the market. What type of brush cleaner you use will depend on how many brushes you have in your collection and on your makeup-wearing habits. But no matter what, it’s a good idea to have both an option for deep cleaning and a spot treatment on hand. This way you don’t have to worry about leftover powders mixing together while you’re doing your makeup, even when you’re in between washes. Why you’ll love it: Cinema Secrets Professional Brush Cleaner was developed by a Hollywood makeup artist to deep-clean natural or synthetic makeup brushes. Cinema Secrets Professional Brush Cleaner was developed by a Hollywood makeup artist, so you know it’s the real deal. The formula deeps cleans natural and synthetic makeup brushes as well as tools like spatulas and refillable palettes. It’s also quick-drying, so you don’t have to deal with every wash rendering your makeup brushes out of commission for a full day. Unlike other fast-drying makeup cleaners, this one really delivers more than a surface-level cleanse. “When I received this I had not cleaned my brushes for a while so I probably had about 50 to clean. This would normally take me 45 to 60 minutes if I was lucky. 25 minutes later all my brushes were clean and dry,” writes one Amazon reviewer. Another really cool feature of the Cinema Secrets Professional Brush Cleaner is that it doesn’t require rinsing. You can simply dip your brush in the blue solution, watch it dissolve the makeup, and wait for it to dry. This product has more than 1,000 Amazon reviews with a 4.2-star rating and has been featured by Best Products, Rank and Style, and Into The Gloss. The formula contains non-carcinogenic and environmentally-friendly ingredients. Some reviewers complain about a strong vanilla scent, so if you find that it lingers or are very sensitive to the smell you can give the brushes a quick rinse after cleansing. Why you’ll love it: The e.l.f. Daily Brush Cleaner is a super affordable option for spot cleaning your brushes throughout the week. Sometimes you just need to clean your brushes in a jiffy. The e.l.f. Daily Brush Cleaner is a gentle spray cleanser that’s great for removing color and gunk from your brushes when you don’t have time to do a big clean. And did I mention that it’s only $3? I personally love to use this after a super bold eyeshadow stains my brushes so the colors won’t get muddied next time I reach for the brush. You can spray the bristles directly or spritz the formula onto a paper towel and swirl the brushes over the damp spot to clean them. I like to wipe the brushes either way to make sure the bristles don’t dry stiff. E.l.f. Daily Brush Cleaner has been featured on best-of lists at StyleCraze, Elle UK, and Best Products and has more than 1,500 reviews on the platform Influenster. “This is a good brush cleaner to get that first layer of makeup and grime off of your brushes. I like using this especially if I’m changing up my looks from day to day, but you for sure need another deep brush cleaning soap of some sort!” says another fan. Why you’ll love it: The Sephora Collection Color Switch by Vera Mona Brush Cleaner is a quick-clean sponge that lets you wipe your brushes while you’re working on your makeup. If you’ve ever used a super bright eyeshadow, you’re probably familiar with the problem it poses for continuing your eye look. Unless you have an endless supply of makeup brushes, sometimes you need to wipe them off in the middle of getting ready so you don’t end up with electric blue eyeshadow all over your face. The Sephora Collection Color Switch by Vera Mona Brush Cleaner is like a nail polish remover sponge for your makeup brushes. It’s a dry makeup removing sponge inside a tin that allows you to wipe colors off your brushes without any drying time required. Simply brush the bristles around inside to remove pigment. The sponge itself can be washed with a different brush cleaner or with warm water and soap. Shoppers love how easy the product is to use. It has a 4.6-star rating on Sephora based on 700+ reviews and has been recommended by Best Products, StyleCraze, and New Beauty. “This product does exactly what it says. It allows you to switch colors without having to have a million brushes when using multiple shadows or blushes. I highly recommend this for everyday use between cleaning,” writes one Sephora reviewer. Why you’ll love it: The Bobbi Brown Brush Cleaner is a perfect option for treating the most luxe brushes in your collection. Sure, $17 for glorified soap sounds excessive. But the Bobbi Brown Brush Cleaner does wonders for preserving the life of your brushes. If you have high-quality, expensive makeup brushes that you want to last, it’s worth the investment. This formula is very gentle and conditioning on delicate fibers, but also provides the kind of deep clean your brushes deserve. Per the product description you’re meant to wet your brush heads, then work the cleanser directly onto the bristles and rinse. You’ll have to leave the brushes to dry on a towel, possibly overnight. Bobbi Brown’s brush cleaner formula has a nearly perfect rating on Nordstrom based on more than 100 reviews and has been featured by Rank & Style, Best Products, Elle UK, and StyleCraze. The formula is powerful enough to remove even creamy products like foundation and concealer from brushes, leaving them good as new. “This cleanser works great on all my brushes especially my foundation brush. I was using another brand that has an alcohol base and this works much better. It’s soapy. 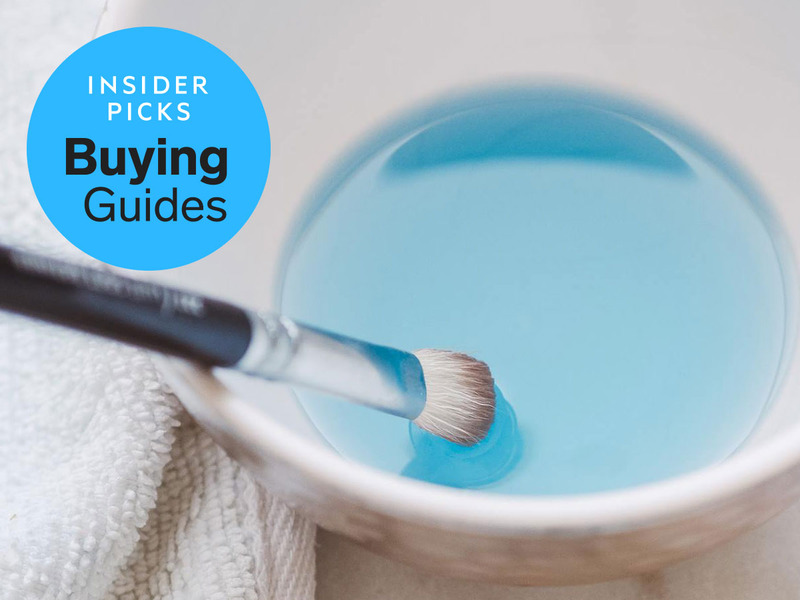 It takes a few passes of massaging the brush and rinsing, but my brushes are clean and retain their shape with this cleanser,” writes one Nordstrom shopper. Why you’ll love it: The Sigma Spa Express Brush Cleaning Mat features various raised sections to give all of your brushes the most thorough clean possible. Makeup brush cleaning mats seem like a gimmick. Who needs a giant pink rubberized surface that sticks to the bottom of your sink when you can clean brushes with dish soap and the palm of your hand? Well, if you have a ton of different brushes, the Sigma Spa Express Brush Cleaning Mat is a great investment. This mat, beloved by YouTube personalities, makeup experts, and shoppers alike, features seven different textured surfaces that help you get the best clean for every brush in your collection. The mat suctions to the bottom of your sink so it stays put while you work. Instructions help you figure out which areas should be used for which types of brushes. Of course, the downside here is that you’ll need a separate soap or cleanser to use with the mat because the rubberized material won’t totally cleanse bristles on its own. This concept might be a bit complex if you’ve only got a handful of brushes. But if you’re collection is huge, this could help you wash everything faster and more thoroughly. The Sigma Spa Express Brush Cleaning Mat has an almost perfect star rating on Nordstrom based on 450+ reviews. It’s also been featured by Fashionista, New Beauty, and The Strategist. “Fits perfectly in my smaller sink. And makes it soooo much easier to clean my brushes. Cut down my brush cleaning time in half! And the best part of all, is it keeps my sink clean! So I don’t have to go and wash my whole sink when I am done cleaning my brushes. Would give 10 Stars if I could,” writes one shopper.